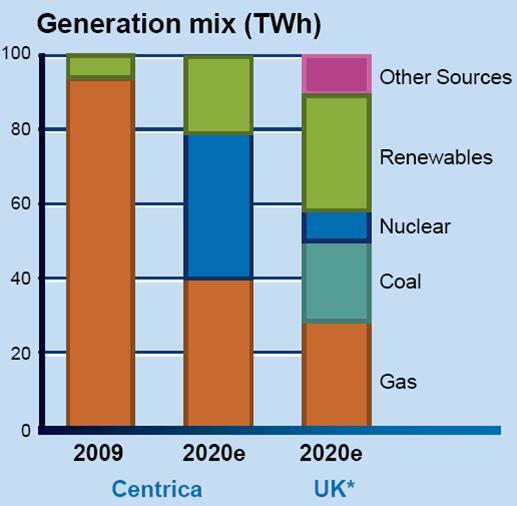 Centrica is a company that I generally admire. In its 15 years of existence it has pursued a dogged, ambitious and pretty successful gameplan, whilst remaining flexible enough to alter course from time to time when adverse winds have blown. They are pretty competent & professional; and I particularly like the (relatively) high level of openness & disclosure, though there has been the occasional lapse. Of course, they operate in a sector where it is easy to fall foul of public opinion periodically, and they get their share of opprobrium over gas & electricity prices. Every year or so, someone sets a rumour running that Gazprom is going to buy them up (which ain't gonna happen): but they have remained independent. We've had occasion to analyse the evolution of their once extreme 'merchant energy' strategy, which became progressively more challenging post-Enron, and is now heavily modified by successive pragmatic moves in the direction of vertical integration. Clearly, their acquisition of 25% of British Energy was a step along that path, filling a fairly large short electricity position. But a heavily nuke-oriented strategy ? Take a look at the chart - by 2020 they expect to have invested in at least a couple of new nukes with more building, and to be significantly reliant on their output (along with that of existing nukes) - far more so than industry average. Fellahs, is this wise ? Even your media outlet of choice, the comely Rowena Mason at the Telegraph, is wondering out loud whether the game is up. Stick to gas guys, it's what you're good at. Plenty of time for another touch on the tiller before 2020. And the BE investment ? Sunk costs. Move on. Not exactly an expert, but with all these whinges about "carbon floor" from companies, a lack of real anti-nuke feeling in the UK (c.f. Atomkraft? Nein danke! ), perhaps they see a hole to fill? 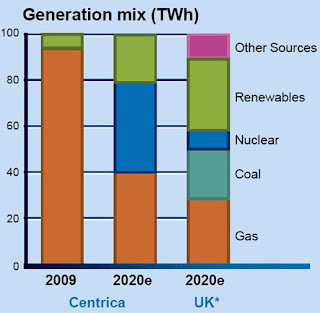 The UK projection by Huhne might not have much nuke, but it also has a lot of renewables, making it as believable as a Gordon Brown economic projection. I wish the government would stop talking about nuclear and allow someone to bloody well build one. Maybe then we (or, more importantly power companies) can decide on the economics? It seems to me that there is a risk-aversion so strong that while we decide as a nation / market what to do the power will run out. Give 6 months for a slew of "turns out fukushima was pretty much nothing, all the short half life isotopes are gone and nobody has died of nuclear related glowingness" TV docs and newspaper pieces and couple that with "we've got tons of Thorium lying around that we could make decent reactors out of" type thinking and also considering the 30 days to Mars VASIMR engines will need some sort reactor to make them viable and keeping your hand in with Nukes seems fairly sensible. As BE says - we should get on with it. indeed, let them get on with it! I wish the government would ... allow someone to bloody well build one. No-one has stopped any company building one in the last 15+ years, if they wanted to build one. No law blocked it, and at times the politicians would have been quite positive. It's because they have not been economic that on-one has wanted to build one (assuming you had to raise private finance). When oil prices went up a lot, a glimmer of hope on the economics of nuclear opened up, but that has closed down again. Hence it is all about lining up subsidies, or putting a lot of extra costs on competitors (carbon pricing). ND said: "indeed, let them get on with it! (that's them, not we...)"
This is just a re-run. We need electricity for ... well, everything else. Electricity therefore has a strategic importance not shared by, say, turnips (because there are substitutes for turnips) or even in extremis by gas (because there are some substitutes for gas). Imported oil and gas leave us to the kindness of Jonny Foreigner. Some people have the quaint notion that Jonny's purpose in life is to look after the indolent Brits. It isn't, and he won't. At precisely the most awkward time. So as a primary source we need a reliable, cheap, always on, electricity source not dependent on vast fuel storage. The nearest we have is nuclear (no, it's not as cheap as gas, but gas is more suitable for domestic heating and industrial processes). With say 60% nuclear we could strategically afford to use coal in second place with gas as an emergency back-up. On the security of supply front, do recall identified minable uranium resources only last for 100 years at current usage rates. We can find more (at greater cost), but if consumption quadrupled we could be expecting supply difficulties before the 80-odd year lifetimes of new builds ended. With current technology, nuclear cannot itself replace oil/gas for current electricity generation, let alone displacing other usage. There is the idea of extracting uranium from seawater, or switching to Thorium, but that would add costs further hitting nuclear economics. Eventually fusion will be cracked, but that still looks a long way out. Lets start using oil/gas more efficently first.